Mavis (Selena Gomez) and Johnny (Andy Samberg) in Sony Pictures Animation's HOTEL TRANSYLVANIA 3: SUMMER VACATION. Dracula (Adam Sandler), Griffin the Invisible Man (David Spade), Murray (Keegan-Michael Key), Eunice (Fran Drescher) and Frank (Kevin James) in Sony Pictures Animation's HOTEL TRANSYLVANIA 3: SUMMER VACATION. Mavis (Selena Gomez) and Dennis (Asher Blinkoff) in Sony Pictures Animation's HOTEL TRANSYLVANIA 3: SUMMER VACATION. Blobby in Sony Pictures Animation's HOTEL TRANSYLVANIA 3: SUMMER VACATION. Mavis (Selena Gomez) and Dracula (Adam Sandler) with the airline crew on Gremlin Air in Sony Pictures Animation's HOTEL TRANSYLVANIA 3: SUMMER VACATION. El Chupacabra (Jaime Camil) in Sony Pictures Animation's HOTEL TRANSYLVANIA 3: SUMMER VACATION. Vlad (Mel Brooks), Murray (Keegan-Michael Key), Griffin (David Spade), Drac (Adam Sandler), Mavis (Selena Gomez), Frank (Kevin James), and Eunice (Fran Drescher) pose for a selfie in Sony Pictures Animation's HOTEL TRANSYLVANIA 3: SUMMER VACATION. The Kraken (Joe Jonas) in Sony Pictures Animation's HOTEL TRANSYLVANIA 3: SUMMER VACATION. Ericka (Kathryn Hahn) and Dracula (Adam Sandler) in Sony Pictures Animation's HOTEL TRANSYLVANIA 3: SUMMER VACATION. Johnny (Andy Samberg), Dennis (Asher Blinkoff), Mavis (Selena Gomez) and Dracula (Adam Sandler) in Sony Pictures Animation's HOTEL TRANSYLVANIA 3: SUMMER VACATION. Dracula (Adam Sandler), Murray (Keegan-Michael Key), Dennis (Asher Blinkoff), Mavis (Selena Gomez) and Johnny (Andy Samber) in Sony Pictures Animation's HOTEL TRANSYLVANIA 3: SUMMER VACATION. Blobby (Genndy Tartakovsky) in Sony Pictures Animation's HOTEL TRANSYLVANIA 3: SUMMER VACATION. Johnny (Andy Samberg), Mavis (Selena Gomez), Drac (Adam Sandler), and the rest of the Drac Pack are back in Sony Pictures Animation's HOTEL TRANSYLVANIA 3: SUMMER VACATION. Dennis (Asher Blinkoff), Mavis (Selena Gomez), and Johnny (Andy Samberg) in Sony Pictures Animation's HOTEL TRANSYLVANIA 3: SUMMER VACATION. Johnny (Andy Samberg), Mavis (Selena Gomez), Dennis (Asher Blinkoff), and Drac (Adam Sandler) in Sony Pictures Animation's HOTEL TRANSYLVANIA 3: SUMMER VACATION. Mavis (Selena Gomez) in Sony Pictures Animation's HOTEL TRANSYLVANIA 3: SUMMER VACATION. Dennis (Asher Blinkoff), Drac (Adam Sandler), Mavis (Selena Gomez), and Johnny (Andy Samberg) in Sony Pictures Animation's HOTEL TRANSYLVANIA 3: SUMMER VACATION. Gremlin Stewardess (Aaron LaPlante) in Sony Pictures Animation's HOTEL TRANSYLVANIA 3: SUMMER VACATION. Murray (Keegan-Michael Key), Griffin (David Spade), Drac (Adam Sandler), and Frank (Kevin James) in Sony Pictures Animation's HOTEL TRANSYLVANIA 3: SUMMER VACATION. Captain Ericka (Kathryn Hahn), Murray (Keegan-Michael Key), Drac (Adam Sandler), and Frank (Kevin James) in Sony Pictures Animation's HOTEL TRANSYLVANIA 3: SUMMER VACATION. 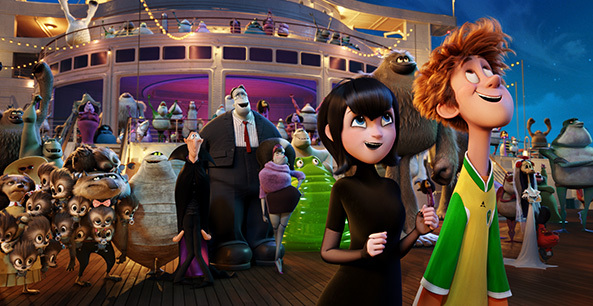 Winnie (Sadie Sandler), Dennis (Asher Blinkoff), Johnny (Andy Samberg), Mavis (Selena Gomez), Drac (Adam Sandler), and Bob (Joe Whyte) in Sony Pictures Animation's HOTEL TRANSYLVANIA 3: SUMMER VACATION. Dennis (Asher Blinkoff) and Winnie (Sadie Sandler) in Sony Pictures Animation's HOTEL TRANSYLVANIA 3: SUMMER VACATION. 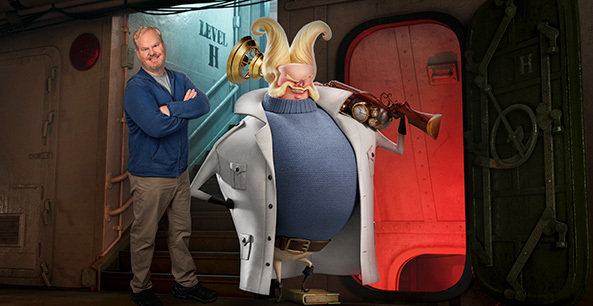 Jim Gaffigan voices Van Helsing in Sony Pictures Animation's HOTEL TRANSYLVANIA 3: SUMMER VACATION. Keegan-Michael Key voices Murray in Sony Pictures Animation's HOTEL TRANSYLVANIA 3: SUMMER VACATION. Selena Gomez voices Mavis in Sony Pictures Animation's HOTEL TRANSYLVANIA 3: SUMMER VACATION. Joe Jonas voices The Kraken in Sony Pictures Animation's HOTEL TRANSYLVANIA 3: SUMMER VACATION. Andy Samberg voices Johnny in Sony Pictures Animation's HOTEL TRANSYLVANIA 3: SUMMER VACATION. David Spade voices Griffin in Sony Pictures Animation's HOTEL TRANSYLVANIA 3: SUMMER VACATION. Kathryn Hahn voices Ericka in Sony Pictures Animation's HOTEL TRANSYLVANIA 3: SUMMER VACATION. Asher Blinkoff voices Dennis in Sony Pictures Animation's HOTEL TRANSYLVANIA 3: SUMMER VACATION. Chrissy Teigen voices Crystal in Sony Pictures Animation's HOTEL TRANSYLVANIA 3: SUMMER VACATION.